Nepal is the kingdom of the mighty Himalayan Mountains, a clashing of cultures, a melting pot of religions, and the Adventure Capital of the World. This trek will take you - within a medium length trip to the high Himalaya - to experience the very best of Nepalese, and Khumbu culture - all wrapped up into one of the very best treks in the world! This trek is an incredible journey into the high mountains - cramming the absolute maximum into a safely constructed itinerary. Trekking in the footsteps of Hillary and the famous mountaineers - you will reach high into the Khumbu Region - with good views of the highest peaks. During the course of your trip you will have a wonderful, challenging trek into the high mountains, with time to acclimatise, and time to explore the high mountain region of the Khumbu. The trek is all about the high mountain environment, but also a fascinating peek into the world of the Nepalese - and their unique mountainous kingdom. The trek will reach a maximum of 4600m, at Tug La …. But the unique high mountain Buddhist Culture may be the most memorable aspect of this trip for many! Day 3 to Day 11 - Flight from KTM to Lukla, Trek from Lukla to Tengboche—from where you should be able to witness stunning views of the mighty 8000m peaks of Everest, Lhotse and Nuptse. Trek then continues on via Pheriche to the high point of Tug La - the stunning pass into the Glacial Valley of the Khumbu Glacier, then returning to a special overnight in Pangboche - home of the trek's quietest Buddhist Monastery. We shall then trek back via Namche to Lukla via Kumjung and Kunde for return flight to Kathmandu. 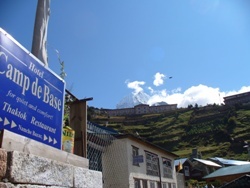 The trek will acclimatise gradually, and then climb up to Namche Bazaar. NB on day 6 you will spend one acclimatisation day in Namche, where you can spend the time exploring the trail to Thame. 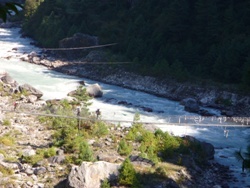 On this trail you will encounter Tibetan traders bringing their Chinese goods by Yak from Tibet. From Namche the trek will climb onwards to the Monastery at Tengboche for sublime views, and amazing experiences with the Buddhist Monks high in the mountains. Finally you will have a chance to trek via Kumjung and Kunde for a real slice of Nepalese Mountain life, the real trading and agriculture of the high mountains in two unique functioning villages. Day 12 - Easy return trek to Lukla before an early morning return flight to Kathmandu. Day 13 - In Kathmandu you have one final day to relax and take in the sights and sounds, maybe with time to explore the amazing religious focal points of Bodnath (Buddhist Stupa) and Pashupatinath (Hindu Temple) as well as the main square Kathmandu (Durbar Square). You will also have time on day 12 in the evening for a great meal in one of the cities many famed restaurants that assemble a huge variety of World Cuisines. Why not also treat yourself to an Everest Beer! Day 14 - You may have time to do some last minute shopping in the morning (depending upon your flights) before your return flight to London. Whilst on trek you will be staying in simple lodges along the trail. These are an essential part of the trekking experience in the Himalayas, as you will be staying with other fellow trekkers from around the world, sharing stories and maybe a few games of cards in the evenings… In Kathmandu we shall be using a local 2-3 star hotel—this means it will be comfortable, well located, and with running hot water (most of the time) and en-suite facilities. Remember this is Nepal—and not England! What is a Level 2.0 Trekking Challenge Like? For this type of challenge - you can expect either distance (up to 12 or 15 miles), or altitude gain - around 700m. But not both! If you climb, then the distance will be less, if you cover the distance, then the altitude gain will be little. Typically conditions underfoot will be good - although there are exceptions to this. If you encounter rough conditions underfoot, then the distance / altitude will be reduced. These events would suit someone of good all round fitness, who takes exercise regularly - without necessarily being of high fitness. How Fit Do I need to be to join a Level 2.0 ‘Trek’? You must be active and with moderate fitness level. You should be taking regular exercise, consisting of regular walks and possibly other sports (swimming / football etc.) You should be comfortable in undertaking long country walks of up to 7 hours or 15 miles in the lowland English countryside.